This black and white photograph shows the first Atchison, Topeka & Santa Fe Railway Company's skyway aircraft at the municipal airport in Los Angeles, California. 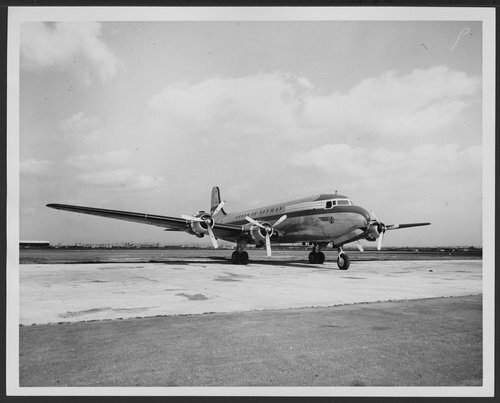 The reconverted DC-4 was capable of carrying 20,000 pound of payload. The cargo space was lined with V white board, a fiberglass composition designed to protect fragile cargo. High efficiency refrigeration units were engineered, designed and fabricated by the Douglas Company for installation.